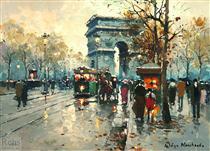 Antoine Blanchard is the pseudonym under which the French painter Marcel Masson (15 November 1910 – 1988) painted his immensely popular Parisian street scenes. 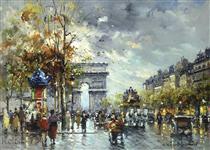 He was born in a small village near the banks of the Loire. 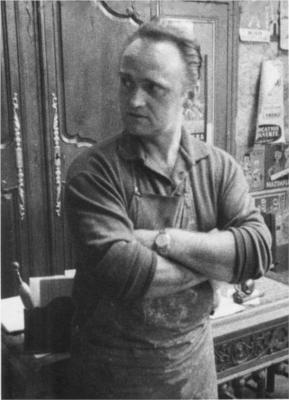 Blanchard received his initial artistic training at the Beaux-Arts in Rennes, Brittany. 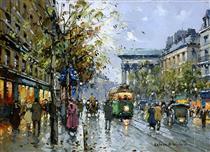 He then moved to Paris in 1932 where he joined the Ecole des Beaux-Arts. He won the Prix de Rome. 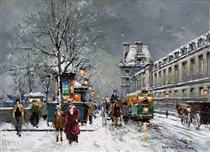 Like Édouard Cortès (1882–1969) and Eugène Galien-Laloue (1854–1941), Antoine Blanchard essentially painted Paris and the Parisians in bygone days, often from vintage postcards. 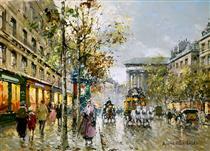 The artist began painting his Paris street scenes in the late 1950s, and like Cortès, often painted the same Paris landmark many times, in different weather conditions or various seasons. 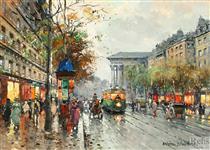 The most recurrent topics were views of the capital city in cloudy or rainy days, showing streets busy with pedestrians in a rush to go home, and bright storefronts reflecting on wet streets. 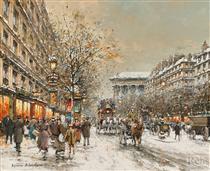 Antoine Blanchard died in 1988. 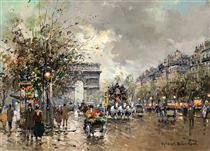 Arc de Triomphe Antoine Blanchard ? 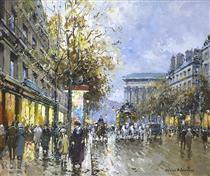 Boulevard de la Madeleine Antoine Blanchard ? 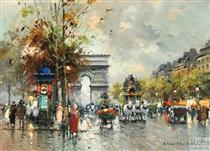 Porte St. Denis Antoine Blanchard ? 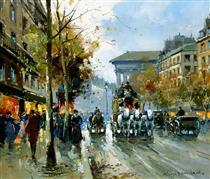 Porte St. Martin Antoine Blanchard ? 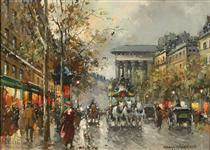 Avenue de l'Opera Antoine Blanchard ? 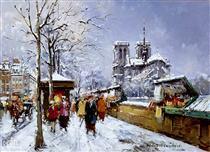 Booksellers Notre Dame, Winter Antoine Blanchard ?